Hockley Mint will mark its 25th year in business in 2017, and is set to celebrate its British manufacturing capabilities and support of young talent in the industry with the launch of a jewellery design competition, inviting jewellery designers to help commemorate its silver anniversary year by designing a unique, statement piece of silver jewellery that represents Hockley Mint’s standing in the industry. The competition will officially launch at Jewellery & Watch Birmingham in February 2017 at a drinks reception on stand 17R30/S31 at 5pm on Sunday 5th February. Entries will be judged by an industry team selected by Hockley Mint, and the winning piece will be cast by Hockley Mint and unveiled at the International Jewellery London show in September. It will then be displayed in Hockley Mint’s refurbished boardroom to commemorate the 25th anniversary. Gary Wroe, managing director of Hockley Mint, said: “We have always been keen to support young talent in the industry through our involvement in apprenticeship schemes and training programmes. 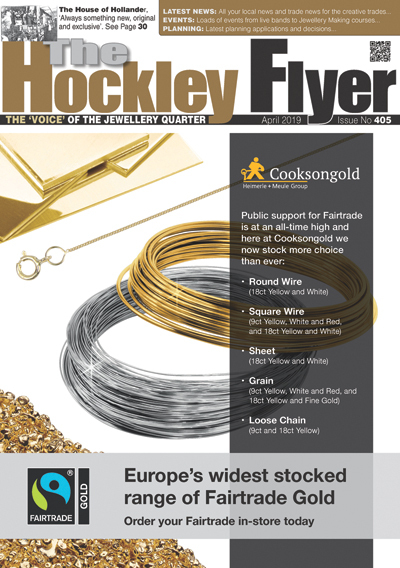 Hockley Mint has become one of Europe’s largest jewellery manufacturers since its Merrell Casting business was established in 1952. After Hockley Mint was set up in 1992, the company has grown to incorporate three sectors to the business: ready-to-wear product ranges including MariMe and the award-winning Canadian diamond range Arctic Circle; cast components including Wedfit and diamond mounts, chain, findings and precision-engineered jewellery parts; and production techniques from its Merrell Casting arm, such as casting, engraving, CAD, bespoke design, CNC and finishing. As a UK-based manufacturer with the in-house resource of a vast array of services, Hockley Mint is in a unique position to create anything from a one-off design to large production orders, always utilising the best possible production techniques. The Jewellery Quarter based fine jewellery.